A versatile singer blessed with a clear, pure voice, Rita Coolidge was a capable stylist in rock, pop, R&B, country, and folk, and was a hugely in-demand session vocalist outside of her own solo recording career. 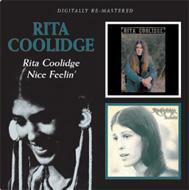 This is the digitally remastered two-for-one CD that includes Coolidges first two solo albums: RITA COOLIDGE (1971) and NICE FEELIN' (1972). Both albums made the US Top 200.